I am getting some work done in a hipster café in Florence. There are shouts of “Ciao!” and fedoras and tattoos and studded biker boots everywhere. I people-watch, taking in all the little details, like an insurgent into the Italian culture, although not a very good one. I feel so pale and unstylish and quiet next to them, but as if by being in their presence, I’m soaking in their passion and appreciation for life. No wonder people flock to this country. Why can’t we live like this? Eat dinner on the floor as you await your train, but still pour your beer into plastic glasses? Take your dog to dinner and on the metro? Close most shops and restaurants on Sundays? All the touching and the kissing? I couldn’t find my platform at the train station yesterday. (The station being called, by the way, Santa Maria Novella. I mean! Try saying that three times without falling in love.) Of course there were no signs. I asked a dude wearing very colorful shoes and very colourful glasses, and he pointed out where I needed to go, and then walked me there, his hand on my arm in the most unsleazy way possible. I wished I could tell him how much it made my day. I slept till 10 again today. Actually, 10:30. Then I had cake for breakfast. I’ve given up even trying to be good. I’m only in Italy a few more days. And a girl with her cat on a leash. And there is not a Starbucks in sight. You just want to inhale it and bring it all with you. I take myself out for dinner, to a little restaurant on the other side of the river, away from the tourist hubbub. Morgan, having spent the day at the Uffizi with her mom and aunt, is drinking wine. We talk about food, and boys, and about wanting something-but-not-everything. Even though we only spent two days together, it feels weird to be enjoying Tuscan food without her. I send her a photo of my appetizer, which is an undefinable combination of bread, olives and cheese, and makes me – you guessed it – want to get down on my knees and cry. Fortunately, she actually knows what this means. After my main course, I order dessert – panna cotta, which is so light yet succulent, it's practically levitating. I share my order with Morgan. "I don't know what's wrong with me," I say. Wiser words have never been spoken. I order another glass of wine, just to make sure. 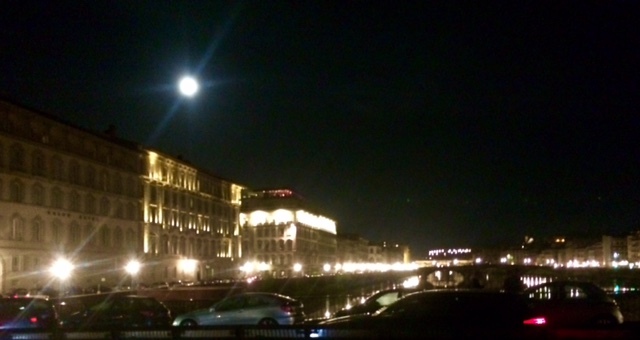 And then I walk back to the train station, under the full moon of the Tuscan night. Beautiful writing. I want to travel. Thank you.